We’re getting alternative today. Don’t say we’re not diverse. We’re from Philadelphia, PA. We wear the East coast identity on our sleeve a fair bit. It’s a reality that your place impacts writing. The band’s songwriters make haste to revel in that truth. Two of the three songwriters, Bruce and Rich, go back to younger days. They met each other from playing local shows. Aaron, the third songwriter, was introduced to Bruce and Rich by their mutual friend and former studio engineer Erik. Bruce, Rich, and Aaron from that point forward started working on Forever Fight, the band’s debut album. Anthony and Blaine are members of Knightlife as well; on the record they can be heard performing gang vocals (“Insomnia” & “Philosophy”). Their role for the time being is labelled best as live musicians. Anthony met Bruce through playing in a cover band together. Blaine met Knightlife through a mutual friend, his presence served as the first foray into being a two-guitar band. Knightlife has been around since 2013. The band as Bruce, Rich, Aaron, Anthony, & Blaine has been a thing since January 2018. The current lineup made their debut on Radio 104.5 (Philadelphia’s alternative radio station) covering “Live Forever” by Oasis and performing “Tangerines”, the first track on Forever Fight. The band’s name borrows from Bruce’s last name – MacKnight – it’s endlessly empowering how the name was conceived by a young heart yet fits so perfectly with the title Forever Fight and the record’s relationship to life itself. On one hand, Bruce would like to say the idea of including life was intentional at his young age. But that isn’t the case. Merely, he thought it was an interesting play on words in addition to dark/dank imagery that followed. Though he realises now that the band’s ethos exists around songs of life; and love, loss, conflict, resolve, pain, struggle, etc. The band wants to carry heart strings like their heroes: Rivers Cuomo, The Darkness, Fleetwood Mac, Thin Lizzy, Neil Young, Eagles. The band wants to raise digital clarity hell like: The Red Hot Chili Peppers, The Killers, Green Day. Obviously, there is bleed over between those influences. But, it’s the idea that the songwriters in Knightlife want to write personal songs and push all the buttons to make those personalities come to life. Knightlife has this old-classic and new-era vibe to it. Take “Slow Down” & “Insomnia” for a side by side comparison. “Slow Down” is a dark, musty, and aggressive tune that explores a young person questioning guidelines of society. “Insomnia” is a light, reflective, and compassionate ballad that explores a creative mind questioning their own search for a spark. “Slow Down” has a sonic affinity for progression. “Insomnia” is stuck between the same two chords. “Slow Down” takes a long break for a solo, reminding the audience how massive guitars can be. “Insomnia” rocks you in a trance, as the solo arrived, it left. Knightlife’s songs are songs of fascination and experience. Interpersonal relationships are explained on a variety of songs. “Philosophy” and “Tangerines” explore themes of confidence and self-actualisation. It’s fitting that they start the album as they serve to establish the band’s commitment to music making and “fighting forever”. “Oceans”, “Behind the Past”, and “Slow Down” grapple with themes of time: the future, the past, and the present. Ideas of love and relationships exude on the back portion of the record featuring “Molly Ringwald” and “Night Time Sally”. The most potent being the final song “Night Time Sally” begging questions of sacrifice, commitment, and honesty. The word “friend” appears multiple times on the album as to explore situations of love, loss, and conflict between friends. “Overgrown” (our acoustic change-up) and “Chasin’ the Times” lyrically support one another by diving directly into friendships and their complicated nature. Lastly, consider “The Long Way Down” as emblematic of all the songs expression in terms personal thought processes and mental health. The band enjoys drawing lyrical themes from our favourite artists. Take the words “and one that’s not so sweet” paying homage to David Bowie. Or, “try to break the chains” borrowed from Fleetwood Mac. Even “what’s with the shakedown” stems melodically from Lynyrd Skynyrd. Knightlife is energetic like all young bands ought to be, though we’re also loose. We like to approach every show as a new opportunity to perform for an entirely new audience. That sort of thrill helps us bring out our personalities. I think a big part of Knightlife is letting personalities be free and accessible to the audience. I’m not sure if there is one moment exactly but we recall various moments when we’ve seen couples making out during our set. It’s fun to call them out after the song ends; an ovation usually ensues. Bruce plays a white Gibson Custom guitar. It’s a staple of the band’s look. Rich plays a Fender Jazz bass. The drums on the record are a Yamaha rock tour kit with mahogany shells, Tama studio maple snare, and all A custom cymbals. 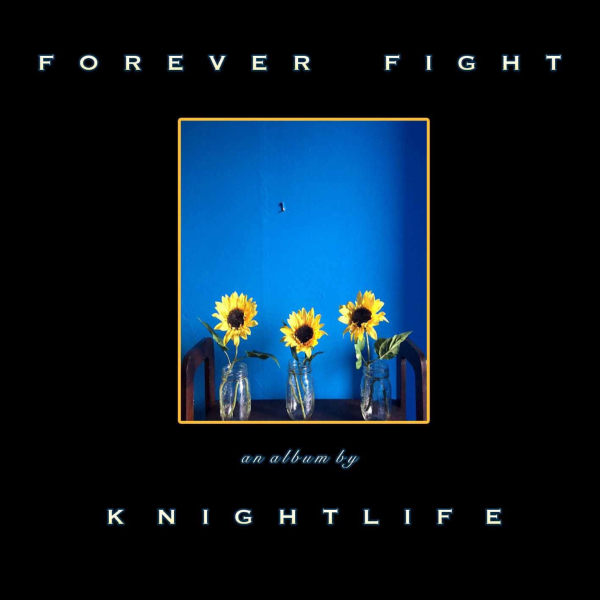 Knightlife is proud to promote their upcoming LP Forever Fight, to be released on October 26th. The release show will be held November 1st at The Grape Room in Philadelphia. We want to give Forever Fight all the love and attention it deserves. The band is hoping to reappear on 104.5 in December to push our campaign forward. We will start a Thursday night residency in January 2019 at The Grape Room. Lastly, sometime at the beginning of 2019 the band will enter the studio to create another full length. If time is not sensitive, Knightlife would love to open up for young Joe Walsh. If time is sensitive then Knightlife would love to open up for The Darkness; proving that indie rock and hard rock can coincide in harmony together. As for a band to open the three-band bill our mates Andorra would serve that perfectly. Kevin, their lead-guy, is a great friend and brother to Knightlife. He’s helped us in so many ways.